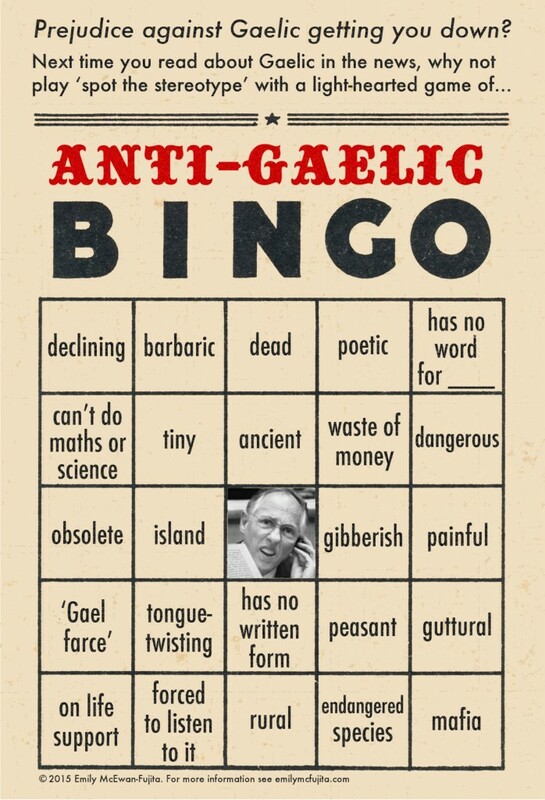 Anti-Gaelic Bingo – 's mise Ciara, seo mo bhlag! Some of these ideas about Gaelic have been circulating in written form since the 1500s, like the idea that Gaelic resembles animal noises or that Gaelic speakers are animals. Chonaic mé an t-alt seo inniu agus bhí orm é a roinnt. Baineann sé leis an íomhá de Ghàidhlig a fheictear sna meáin (agus dar ndóigh is iomaí cosúlachtaí le Gaeilge atá ann). Playing a round of “anti-Gaelic bingo” will help you to spot the stereotypes, lies, and crazy ideas that are continually circulating, and recognize them for what they are. Tá cárta bingo eile ar shuíomh an ailt, agus tá an t-údar, Emily McEwan-Fujita, ar Twitter anseo.